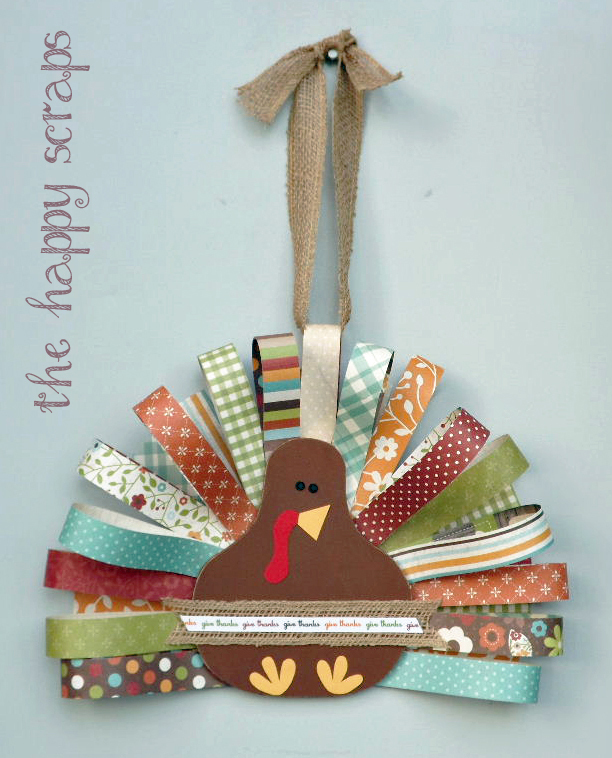 I’m so excited to share this fun Paper Feathered Turkey with you today! A few weeks ago I was in charge of a couple of crafts at Super Saturday, and I had some 1″ x 12″ scraps of this fun fall paper left over. I can’t just throw perfectly good paper away, so I put it in my stash of scraps. 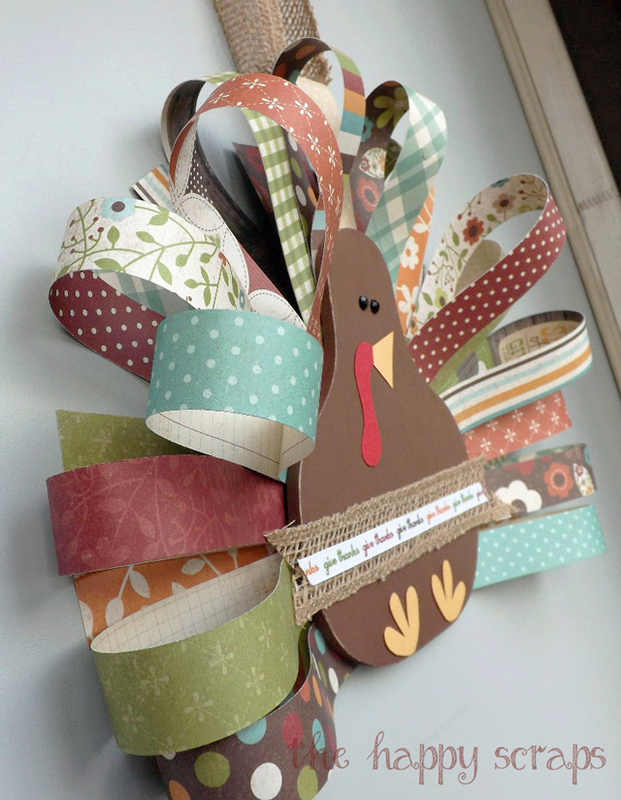 I’d been thinking about making a Turkey, and had a couple of ideas, then I remembered these strips of paper! They were perfect. 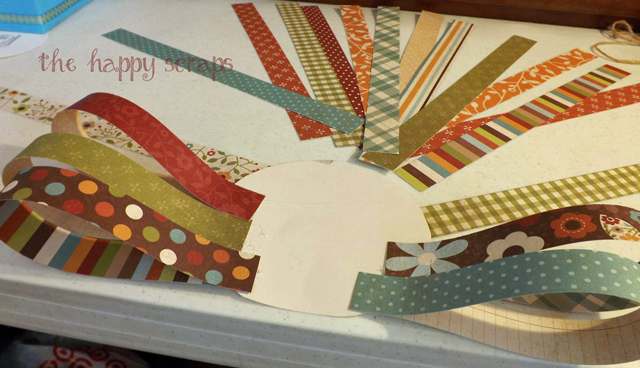 If you don’t already have strips of 1″ x 12″ paper, then use your paper trimmer to cut some. I love this paper trimmer because it is precise and the lines are straight because of the rotary cutter on it. I started by using my jigsaw to cut the pear shape for the Turkey body. I had drawn the shape on a paper then traced it onto my wood and cut it out. 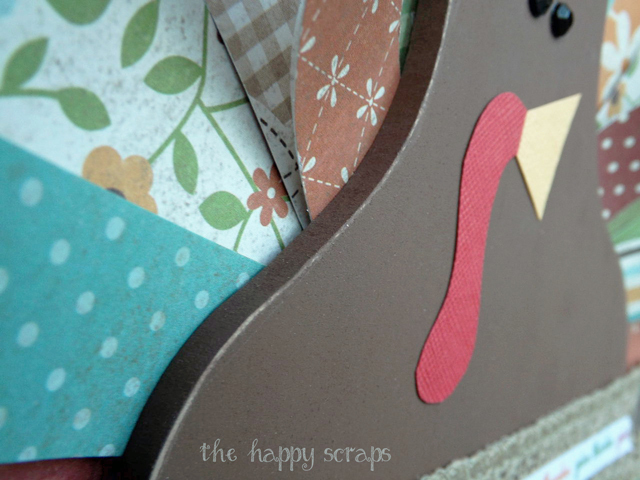 Then I cut a piece of cardstock that was just smaller than the larger part of the Turkey’s body. This is what I glued the paper feathers to. 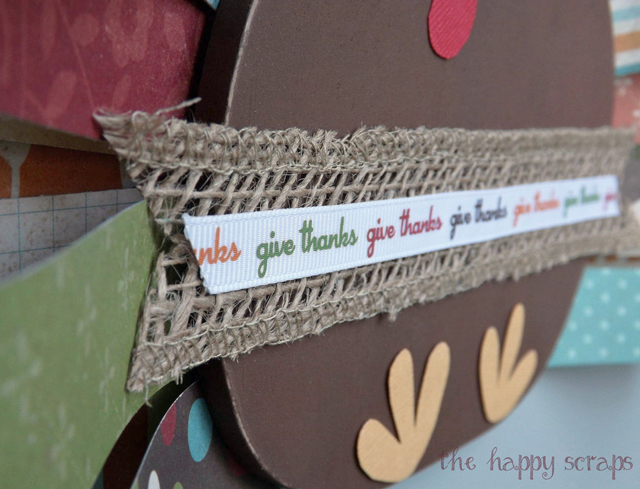 I used my hot glue gun to glue the paper strips and layered them a little as well. I love that the paper is double sided so it’s not boring on the inside of the feathers either! I also free hand cut out the feet from yellow cardstock. 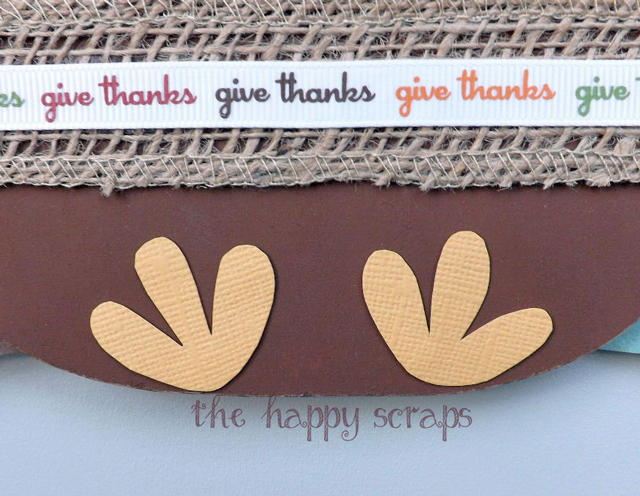 Once I had the face and feet on the Turkey, I thought it needed a little something more, so I added some burlap ribbon, and the give thanks ribbon on top of it. I seriously am loving how it turned out! It’s currently adorning my front door! 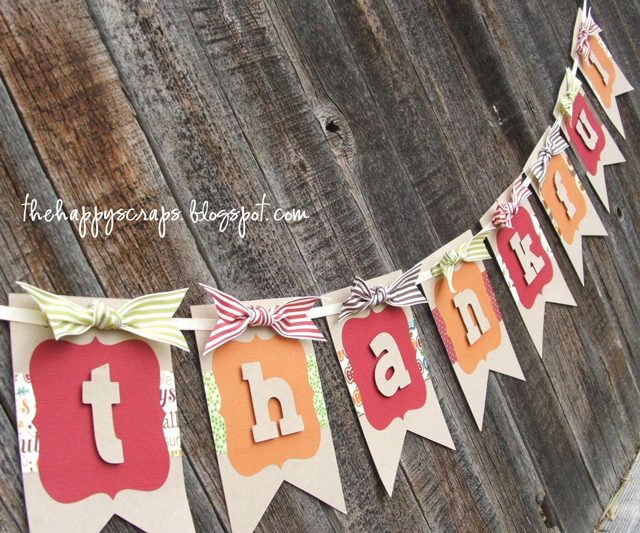 What do you have on your front door for Thanksgiving? 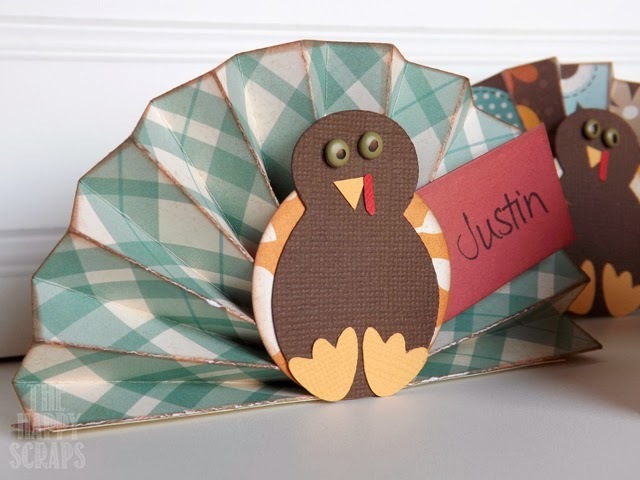 If you enjoyed this post, you might also like these other Thanksgiving projects. Oh this is adorable!!! I am going to pin this – how cute! How cute is that?? Love all of the different paper patterns. Pinned! I love this! It’s different and CA~UTE! We are SO making one for our front door! That is one cute turkey!! Way to go using the jigsaw, that thing scares me! Love all the colors and that the paper is double sided. Turned out so cute! Hey from tessacotton! Love your creation, and the adorable rustic look. 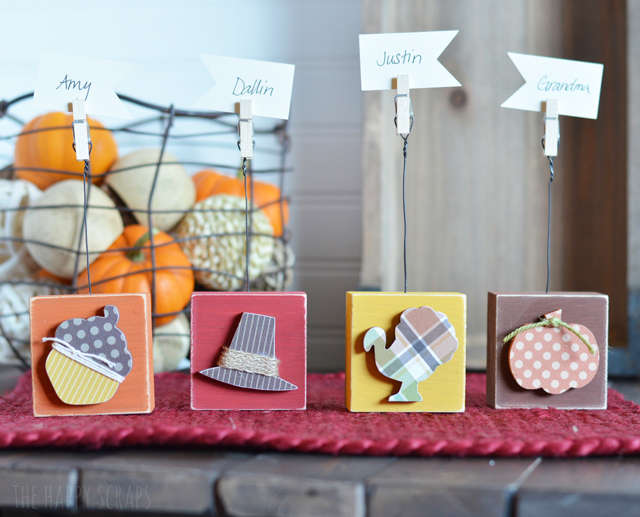 I would be so thrilled if you would link up to my new, thanksgiving themed linky party! cute!! I would be honored if you shared this at my Ginger Jamboree Link Party! This is adorable! I love the paper that you used! I love it! What a great project! I’m definitely pinning this for next year!! this is so cute ! and seems relatively easy 🙂 thanks for sharing ! Super Cute!!! 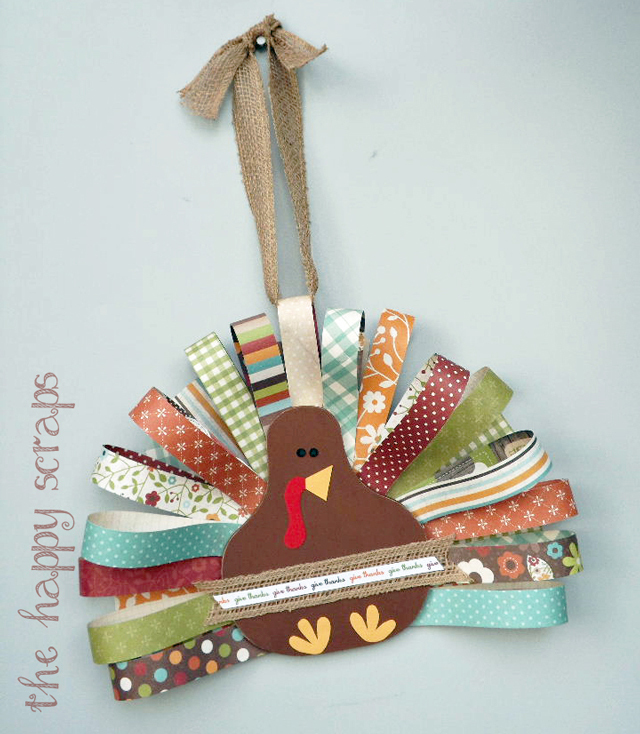 I love this craft, easy and LOVE the results! I think it’s called the waddle??? I could totally be wrong though! How adorable! BTW: that thing hanging down is called a ‘wattle’. Chickens have them too, with a ‘comb’ ( mostly roosters) on their heads. I love your turkey! I’m going to make a few of them today. Do you know approximately how tall and how wide the turkey body is? I absolutely love this bird:) I’m going to let my Sunday school kids make them as well as my grandchildren! What width of plywood did you use? Thanks so much! Hi Kimberly, I’m so glad you like it, it’s one of my favorite projects. I used 1/4″ MDF to cut the turkey body from.